Well Designed Nurseries, Part 6: A Tour of Hadley's Room. 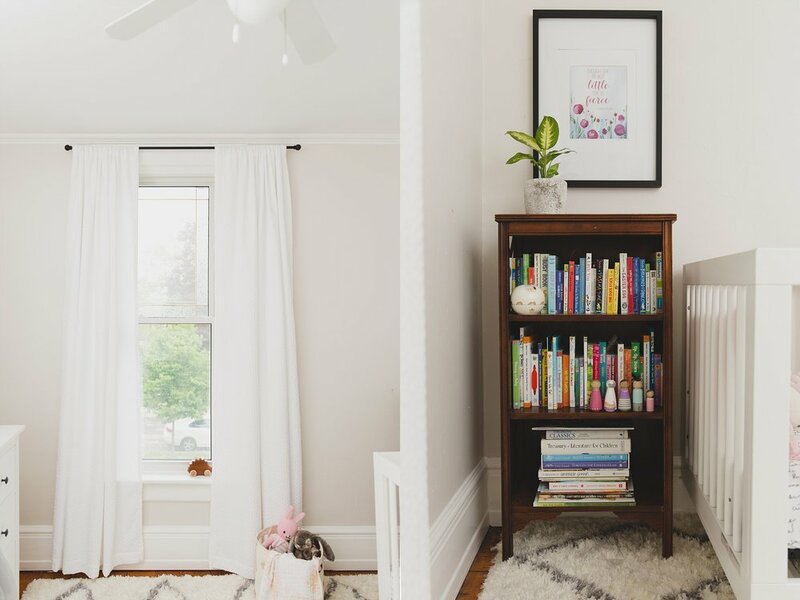 The perfect space for a well read toddler. Welcome back to my Well Designed Nurseries Feature! I started this series last July to inspire expectant parents with design ideas for their new baby's room. It can be overwhelming to get a space together for your little one, so my hope is that these tips will help to inspire you, and help for you to hone in on what's important for the space you and your baby will be spending so much time in. Each nursery I've featured has a very different feel, so there's lots of inspiration to pull from! My last tour featured a chic, girlie nursery from stylist Jaclyn Harper of @jaclynhdesigns. If you haven't seen it yet, you have to check it out, here! This week I'm sharing another sweet and feminine nursery designed by Mom, Kaitlin. One of my favourite things about this nursery is that it features SO many beautiful pieces from local makers. I've tried my best to link up all her favourite Canadian companies so you can check them out, too. The space itself is a a century home in St. Thomas, Ontario. If you love old homes like I do, you'll appreciate the gorgeous original woodwork, the high ceilings and beautiful natural light that floods in through these beautiful tall windows. The nursery belongs to an adorable little toddler named, Hadley. She's spunky and sweet and very bright! We spent the morning reading with mom and dad, playing with her stuffies and rearranging the laundry of course ;) I'll let her show you around! Where did your nursery design inspiration come from? We didn’t know if we were having a boy or girl before birth so we wanted a space that was gender neutral but beautiful too. We were inspired by monochromatic nurseries and wanted to warm it up a bit to feel like us. I read lots of blogs and used Pinterest to make a vision board! Once Hadley was born we integrated elements of pink subtly to the room. One of my favourite things about Hadley's space are all the locally made peices you've chosen. Could you highlight a few of your favourites? We really love to shop small and support local families in all areas of our lives- Hadley’s nursery probably highlights this best. We shopped a lot at Snugglebugz (and were registered there) and at our local baby shop Vesta for all the baby basics. For all the details we looked to local makers. All of the art in Hadley’s room is made by Canadian artists. One of my favourites is her name sign above her dresser made by YellowBrickSigns. The piece of artwork above her bookshelf is by Cici Art Factory that her Aunt Heather chose at the One of a Kind Show for her. And the sketch of Hadley on the shelf is by Sketched by Shai Co. Some of my other faves in the room are the pink knot pillow made by Juju & Jake, the pegs by littlepegpeople, pompom garland by Love Lilah, hedgehog wooden rolling toy made by my uncle and the pink fairy wand by Adaline and the Fairies. What practical elements in your nursery make your days go smoother? The Keekaroo Peanut changer is one of our favourites. Just being able to wipe down the change pad is so easy, and it looks cute too. We also absolutely love our swivel rocker. From nursing all those days/nights, to rocking a sick babe and reading all the books this was such a practical buy. Having a big fluffy comfy rug is so practical too. It muffles the creaky old floorboards of our century home, is soft to lay down on for tummy time or play and adds texture to the whole room. What are your top 3 newborn must haves you couldn't live without? I couldn’t live without my Solly baby wrap (which now we have graduated to a Wildbird ring sling). I loved having her near to me and still getting things done. It was also great for keeping her from getting overstimulated when we were out. We still use the ring sling at 18 months when it’s just easier to have your hands free and not be pushing a stroller. They fold up small to throw into your diaper bag too! Hands down we could not have survived without the Dockatot . Hadley as mentioned liked to be close to me, and this translated to not being put down. I think the Dockatot made her feel cozy and secure. We took that thing everywhere- she didn’t sleep without it until she outgrew it around 10 months old. We credit her good sleeping habits to the Dockatot (and maybe her white noise machine and sleep sacks). And last, a really good nursing pillow. If you are going to be breastfeeding.... do your back a favour. I used My Breast Friend. How has Hadley's room changed as she's transitioned into toddlerhood? Honestly- not much has changed. We started bedtime routines pretty early. I’d say Hadley started sleeping in her room at night around 5 months and from that time we tried to be consistent. We keep her bedroom as a place to sleep, and there are minimal toys in her room. We rotate the bin of books on her night stand more regularly now. Reading books is an important part of our bedtime routine. Her bookshelf in her room is from her Great Oma and Opas house. I can never say no to a new book! Any tips for other mom's when designing their nursery? I highly recommend using a dresser as a change table. There’s no closet in Hadley’s room and that Hemnes IKEA dresser houses all of her clothes, diapers, and bedding. You should see all the beautiful handmade clothing stuffed into this thing! We love shopping Little Mouse, Nest and Nurture, Bugalugs and Os and Oakes for the cutest clothes. I think an overlooked area is lighting of the room. Our overhead light is on a dimmer- which was great for middle of the night feedings and changing. We also have a lamp on her night table with a low watt bulb to read by at bedtime. And her window has light blocking curtains. Everything set to promote a calm and quiet space. I hope you enjoyed touring this beautiful nursery as much as I did! Thank you so much to Hadley + her mom and dad for showing me around your century home!